Right? I think so, too. So, I decided to make some at home! These tasty little buggers are surprisingly easy. I even microwaved the potatoes to cook them faster than baking them in the oven. I usually like to throw some (okay, a lot of) sour cream and sliced green onions, but we also tried them with some Homemade Ranch Dressing and that was pretty awesome, too. 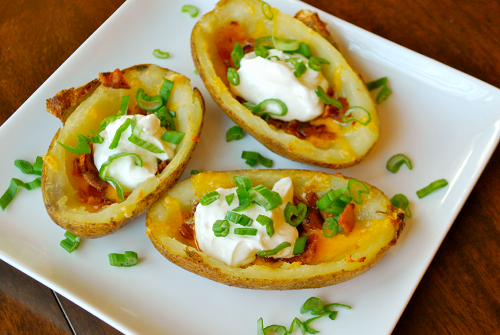 Try out these baked potato skins if you’re looking for an easy and tasty appetizer — or even meal. 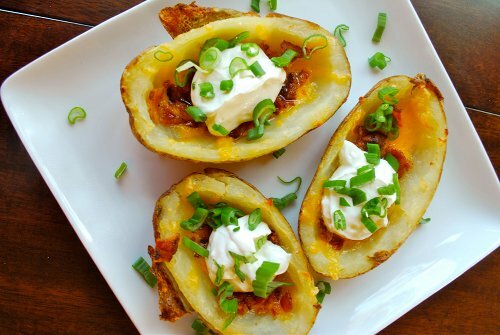 Who doesn't love some good baked potato skins? I certainly do! This is a super easy recipe to make your own at home. 8 small-to-medium russet potatoes about 3 inches long, approx. 2 lbs. 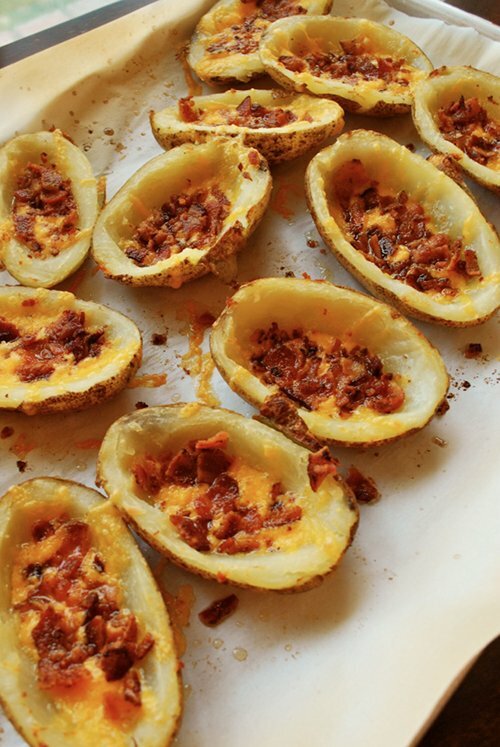 There are two ways you can cook the potatoes in preparation to make the skins. I personally take the shortcut of the microwave method, but feel free to choose whichever you prefer. For the microwave method, clean and scrub the potatoes and place into a large Ziploc bag. Add 1-2 tbsp. water to the potatoes in the bag and then place, unzipped (but bag open upright), into the microwave. Heat on high for 8 minutes. 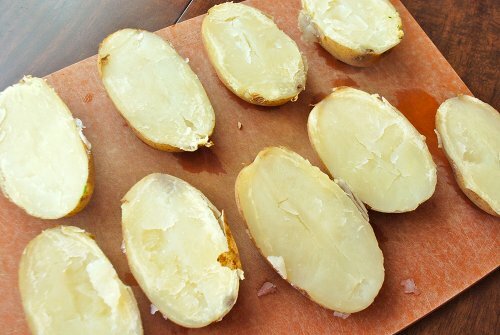 Check the potatoes after 8 minutes by gently squeezing the potatoes using a dish towel or oven mitt. Be very careful as the steam and potatoes are very hot. If the potatoes do not "give" when you gently squeeze them, heat on high for an additional 3-6 minutes, depending on how hard the potatoes still are. Once the potatoes are soft, carefully remove from the microwave. Avoiding the steam from the bag, cut the bag open and allow the potatoes to cool before handling. If using the oven to bake the potatoes, heat the oven to 400 degrees F. Using a sharp knife or a fork, pierce each potato several times. Place the potatoes directly on an oven rack in the middle of the oven and bake until the skins are crisp and a knife easily cuts into the potatoes, about 50-60 minutes. Remove from the oven and allow to cool enough to handle, about 10 minutes. Meanwhile, in a large frying pan, cook the bacon over medium-high heat until crispy. Allow to cool and crumble into small pieces. Set aside. 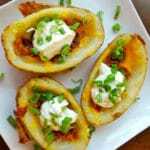 Slice each potato in half lengthwise. Using a spoon, gently scoop out the flesh while leaving about 1/4 inch. 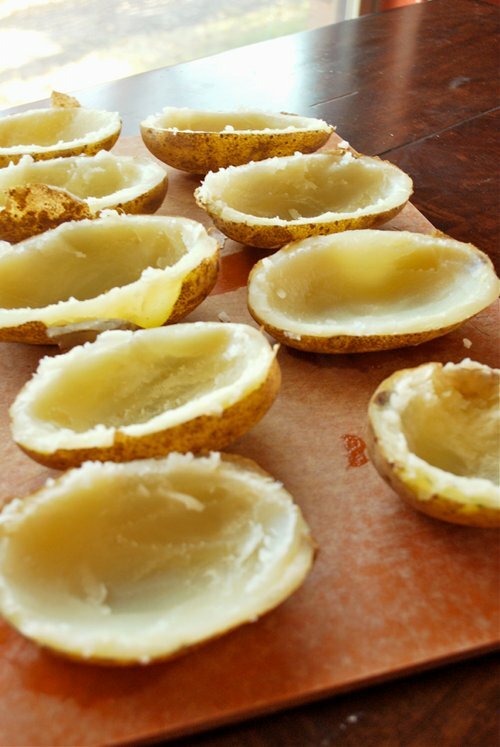 Line a baking sheet with parchment paper and place the potato skins, cut side down so the skins are facing up, on the sheet. Brush the melted butter on the skins and season with salt and pepper. Place under the broiler in the oven. Broil until the butter starts to foam and the skin starts to look crispy, about 2-4 minutes. Flip the skins over and repeat with the skins face up. Broil for an additional 2-4 minutes or until the top edge of the potato starts to crisp. Remove from the oven. 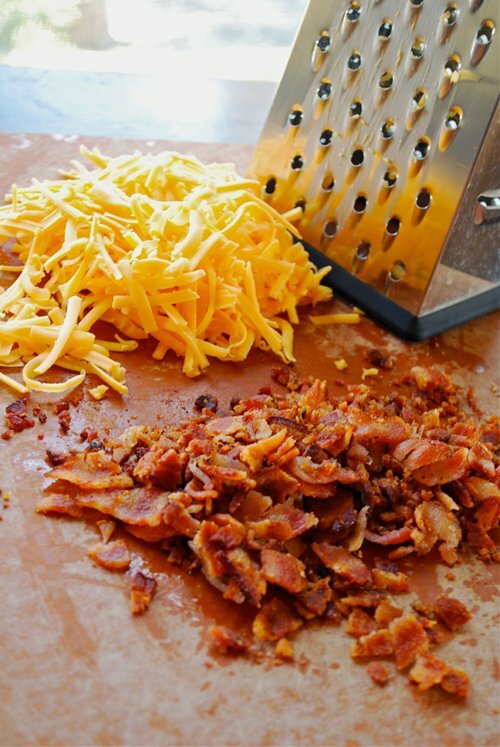 Fill each skin with the cheese and crumbled bacon as evenly as possible. Place back into the broiler and broil until the cheese is melted and bubbling, about 4-6 minutes. Remove from the broiler and top each with a dollop of sour cream (or ranch dressing) and sprinkle some of the green onions over the skin.